The USGS Water Data for the Nation site is a vast repository of water data, both recent and historical, in some cases spanning over a hundred years. Virtually all of the data shown on the site can be downloaded. This tutorial explains the basics on how data is downloaded. 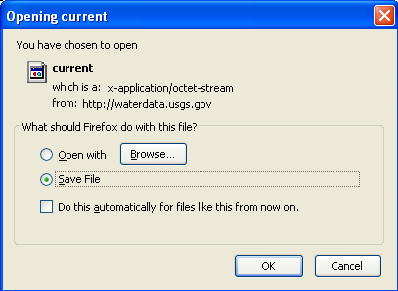 If you expect to develop an application or computer program that periodically downloads data, then it is recommended that you use the USGS Water Services site instead. The USGS Water Services site is relatively new. Not all data available on this site can be downloaded from the USGS Water Services site yet. Over time this will change. The USGS Water Services site will offer more modern and media-friendly ways to acquire data and in most cases delivers the data more quickly. Data downloaded from this site are largely delivered as tab-delimited files of data. 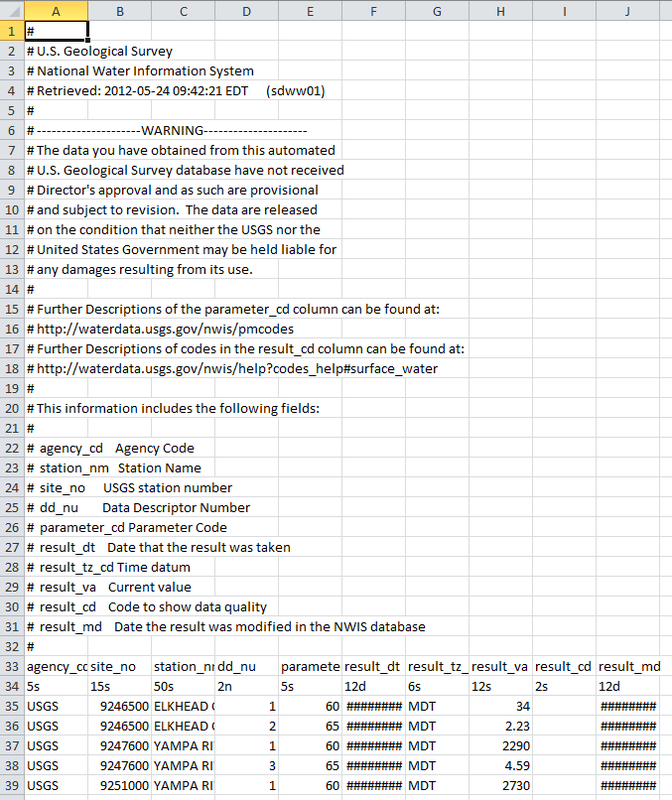 This kind of file generally requires more effort to extract data than friendlier XML and similar formats offered by the USGS Water Services site. USGS Water Services currently supports an instantaneous (current condition), daily values, groundwater levels and a site service. There are no special tricks in finding data to download versus searching for it for display. Whether searching for current condition, site, surface water, groundwater or water quality data, the process is the same. The trick is to search for data as any human would but select a tab-delimited output. (XML is available for site data.) When trying to automate the process, you can copy and paste the resulting URL in your browser into your application. This is the easiest way to start your search for data because you can find these controls on any web page on this site. Look for the two drop down controls near the top right corner of the web site. First, select the data category and geographic area that is closest to what interests you. Then press the GO button. There are other ways to select data. Since they are more complex than using the Data Category and Geographic Area drop down boxes, examples are not shown. If interested in current condition data, you can use the current condition image maps to focus on a state or site. From the national current condition page at http://waterdata.usgs.gov/rt click on the state of interest to go to that state's current condition page. From a state current condition page, such as http://waterdata.usgs.gov/tx/nwis/rt, you can click on one of the color dots to get to that site's current condition page. Links on that page take you to pages where you can refine your query for that site and download its data. You can use the National Water Information System Mapper to find sites geographically with relevant sites show on a map. The Mapper shows up under the Data Category drop down or can be found as a button on the site's home page or on a state's home page. While you can see all sites in various data categories, you can only select to view one of them. This is done by being at Zoom Level 11 or higher, clicking on the symbol associated with the site, then clicking the Access Data link in the pop up. Links on that page take you to pages where you can refine your query for that site and download its data. Refine your list of sites. For example, you might be interested in sites within a particular country, or within a lat/long box. Decide the type of data you want from these sites. For example, if interested in streamflow, you need to tell the system that you want streamflow. Figure 2. Select the Build Current Conditions Table link from the USA or state page. Figure 3. Refining site selection criteria by county. Figure 4. Specifying site selection criteria. Right below it, we select the USGS parameters of interest. Parameters represent the kind of data that interest us. In the example "1" and "2" are filled out by default (we want output to show station name and the date and time), "3" and "4" were added and indicate we want stage (third column) and streamflow (fourth column) data for these sites. The numbers 1 through 4 indicate the sequence that data should appear in the output. In this case, site name appears first and streamflow appears last. Altogether, our query is saying "Give me station name, date and time of the observation, then the gage height and streamflow data for that observation for all current condition sites in Fairfax County, Virginia." Data is normally formatted for reading within a browser, not for data processing, so by default a HTML web page will appear. You can get either summary data or detailed data. Select the option shown in Figure 6. From the dropdown the select tab-separated format, either "saved to file" or "saved to compressed file". Normally you will want the data sent to you as an uncompressed file. Site data can be output in XML. However, the format is very rudimentary. Using the Site Web Service is preferred. The example below shows how to select site data with XML output. When using a browser, the browser determines how to handle downloaded files. This example shows a dialog box that appears with the Firefox 3.6 browser. The name of the file will vary depending on the category of data you are downloading. Generally, you can save it anywhere you want. Enter the file name desired, but make sure it ends in an appropriate text extension like ".txt". 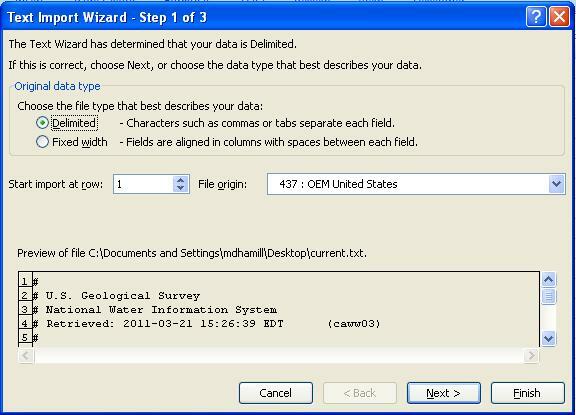 The USGS uses a tab-delimited file format called RDB. Lines that are comments begin with a #. After standard disclaimers come comments that show a list of column names with column descriptions that will appear in the data section of the file. The first non-comment line is a header line. Each subsequent line is a line of data. Fields are separated by ASCII-9 tab characters that are invisible. When loaded into certain tools (like Microsoft Excel), tab-delimited data will align nicely for presentation. Lines are delineated with Unix line endings (ASCII-10 characters). 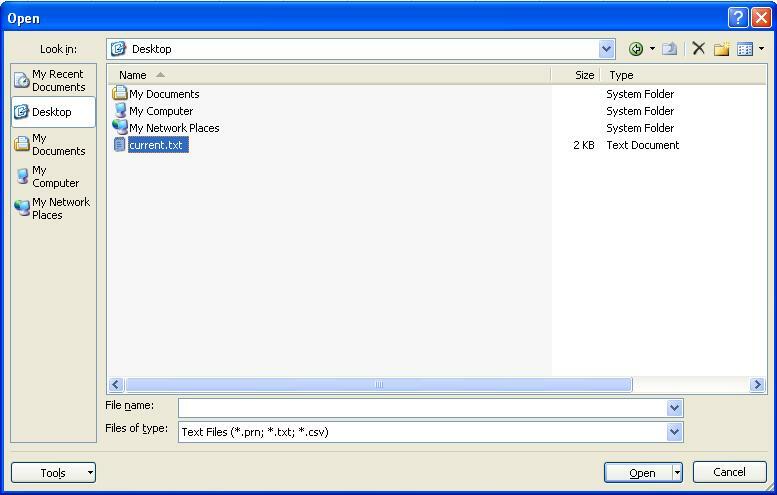 This means if the file is examined in Windows applications like Notepad, it may all appear strung together on one line. This example assumes a file with tab-delimited data was downloaded and renamed current.txt. It also assumes Excel 2010 is used. Select a filter that will allow the file to be seen, for example the Text Files (*.prn, *.txt, *.csv) option. Find the file and select it. You will be presented with a three step wizard. Each step uses the defaults, so you can save time by pressing Finish on the first screen. The data should appear in a blank worksheet. If you see ###### in a column, this is Excel's way of telling you that you need to drag the width of the column to see all the data. Adjust the worksheet as you desire. You may wish to save the result as a native Excel spreadsheet by pressing the Office button, select Save As then select Excel Workbook.